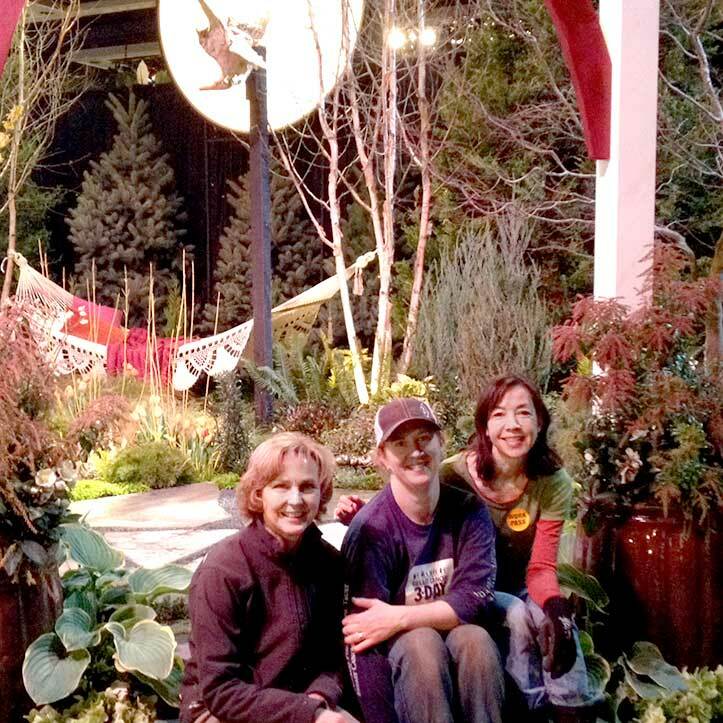 It was approximately a year ago that I approached Susie Thompson, APLD, and told her that I was volunteering to be part of the designer collaboration for the APLDWA garden at the 2015 Northwest Flower and Garden Show. I knew I was signing up for a lot of work, but little did I know the depths to which this would alter my life for the next eleven months. The first meeting was in July. Susie was again our committee chairperson (her 7th year!) and Lisa Bauer (her second year) rounded out our designer triumvirate. 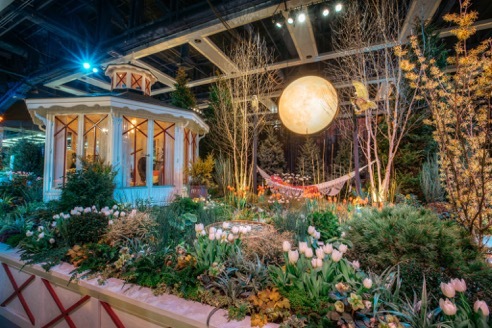 We started with two things: first, the theme for 2015 was 'Romance Blossoms', and second, a local company, Scandinavian Pavilions, led by owners Mark Hickling and Lena Lonnberg, graciously offered to place one of their amazing lusthus in our display garden. Our concepts were based on these two pieces--just like a client's program. It wasn't long into the process that Lisa proposed the one idea that took the simple layouts and concepts to a whole new place--a seven-foot diameter full moon lit from behind. 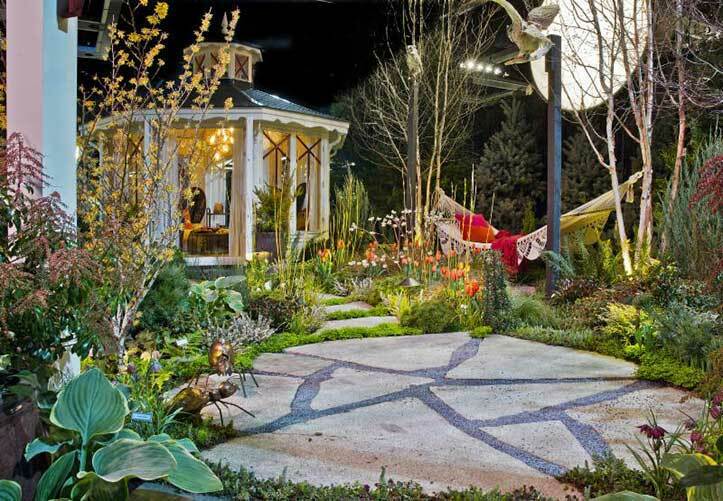 This was the spark, combined with the pavilion and show theme, which drove the design forward and dictated plant choices, stone selection, patio, water feature, arbor shape, and paint colors. --And for the title we all agreed that 'Over The Moon' seemed like the obvious choice. Fall brought an onslaught of meetings for plant choices, plant layout, retaining walls, where to source everything, etc. Lisa and Susie met with Jim Honold at Home and Garden Art multiple times to work out the construction of the moon and scaffolding, and Lisa convinced the Burke Museum to loan us a pair of great horned owls from their collection. 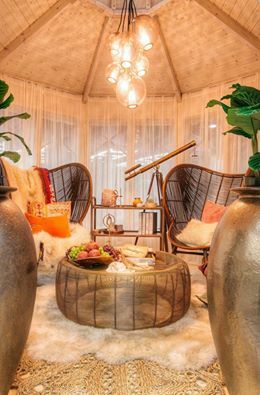 We met with Tom Barrett, Kevin Monohan, and Scandinavian Pavilions to talk construction and time management; meetings with Jason Dallas Design ensured the pavilion interior would be over the top beautiful, of course. Who is responsible for what, when it needs to happen, and how many trucks are needed just scratch the surface for the level of detail we covered. January had us picking boulders and pavers from Marenakos, sourcing containers at AW Pottery, and finalizing the paint palette. Laura Kleppe volunteered her spacious home garage so we could spend hours and days painting the arbor, owl stands, and over 35 feet of retaining walls. We trucked through the mud (and got my Mini, briefly, stuck) to tag birches and choose the just-right Japanese maple. Then it was time to make it all come together. Friday was a full day of loading trucks. 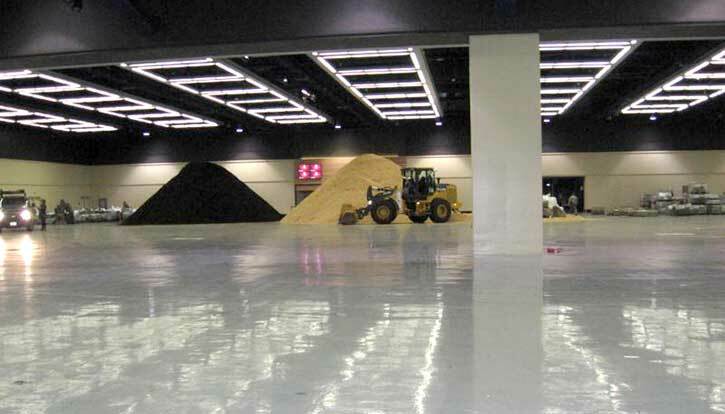 Saturday, bright and early, we arrived at the convention center to begin marking the floor for location of trees, patio and pavilion supports, and wall edges. The garden floor is an amazing thing during build out. Imagine all parts of a city being built simultaneously. Full-scale dozers, pickers, rock trucks, loaders, and forklifts seem to being heading in all directions at once. Dozens of people are lifting, carrying, hauling and pushing carts in and around all of these vehicles. The noise level is raucous; the commotion can be disturbing. And yet, there is camaraderie between the various groups building display gardens. 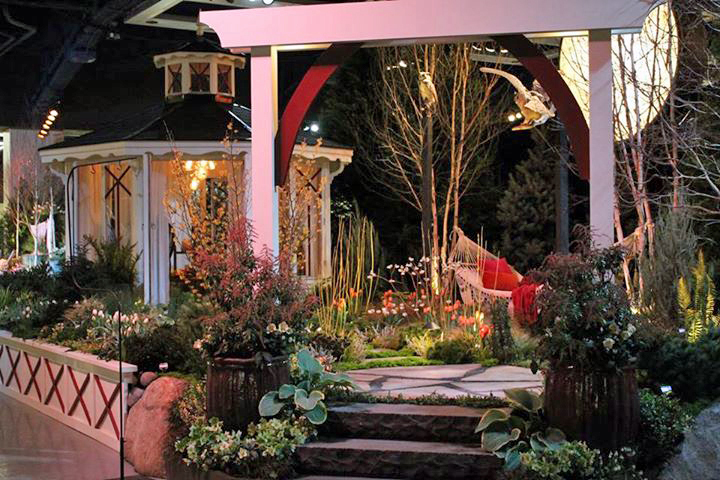 By the end of Saturday, with the help of Scandinavian Pavilions, Tom and Kevin's crews, Dan Billey and other APLDWA volunteers, all the hardscaping and structures were completed including the pavilion, and all of the big trees were set. We fretted until the moon was securely installed--16 feet off the ground. I still went to sleep that night wondering how we'd get it all done. Sunday was amazing. So many of you volunteered your time that day that we finished the evening (a second one ending at 10pm) with 75% of the garden complete. Starting the day, Lisa, Susie and I did not think we were going to have enough help to make the progress we wanted to. You all proved us wrong. Monday really got everything in place. Trips for more ground cover and that just-right hellebore for the entry containers were part of the day. Lighting by HD Fowler and Hollywood Lights brought the perfect moonlit mood to the garden, and time was taken to make sure the owls' eyes were highlighted! If my foggy memory serves, we got out of the convention center early that night, if 8pm is early. Tuesday was a whirlwind. We were so ahead of the game build-wise that the morning was spent cleaning up, selling off extra plants, and sweeping spilled mulch. The garden had to be completed by noon, and we had time to spare. Judging happened that afternoon and those hours seemed to drag on. Coming back that evening for the opening gala and judging results was full of anticipation. We started this process with the Founder's Cup as our goal and yet spent the moments before we learned the results convincing ourselves that we'd be happy if we got a gold medal. 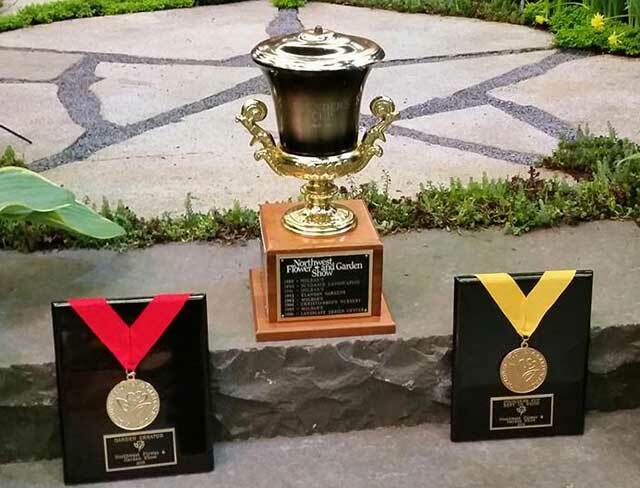 We knew immediately that the garden had been awarded a gold medal, but it seemed an eternity before the end of the evening and the awarding of the Founder's Cup. I don't think I'll ever forget how Lloyd Glasscock tried to fool us (and succeeded for some) into thinking the Cup had been awarded to another garden. Honestly, the rest of the week, the show and the Monday spent in tear down, was a blur. The days were long; I lost my voice multiple times, I spoke with hundreds of people (a day), and yet I seemed to float on a cloud the whole time. All of the work, stress, and anguish were over. Our vision had come to life and exceeded our expectations. Lisa, Susie and I wanted to represent APLDWA at the highest level in this garden. If you helped us in any way, we thank you with all of our hearts. 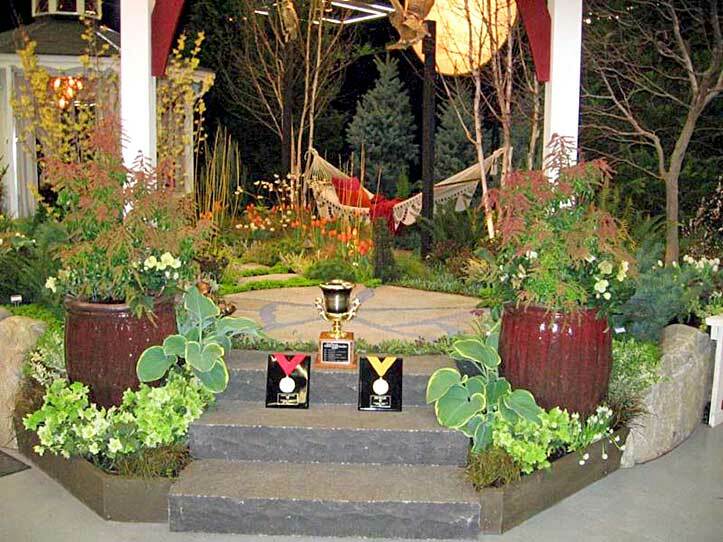 At the 2015 Northwest Flower & Garden Show our display won both a Gold Medal and the coveted "Founder's Cup" which is given to the best display at the show! We are so proud of our design team and all the volunteers that made our winning entry so successful!